Salvation And Survival: I Finally Understand The Beatitudes! I Finally Understand The Beatitudes! 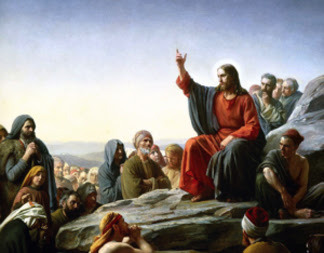 Are you like me ... Have you spent years in the Church and never received an explanation that made sense of what Jesus was trying to say in the Beatitudes? Maybe, there are those of you who are smarter than me, but I don't mind saying that I have struggled with fully comprehending their significance. I mean, I have heard countless expositories on this section of His Sermon on the Mount, and I understand that He is showing us the character of citizens of His Father's Kingdom. These are the attitudes that Christians should have. But what does it mean to be "poor in spirit" and have the kingdom of heaven; or to be "meek" and inherit the earth? What does it mean to "hunger and thirst" for righteousness and be satisfied; or to be "persecuted for righteousness' sake" and receive the kingdom -- all the while being blessed/happy/content to be in these circumstances? One well-respected commentary teaches that the poor in spirit recognize that they have no spiritual "assets." They know they are spiritually bankrupt. With the word poor, Jesus uses the more severe term for poverty. It indicates someone who must beg for whatever they have or get. It has been taught that those who are poor in spirit, so poor they must beg, are rewarded. They receive the kingdom of heaven. And poverty of spirit is an absolute prerequisite for receiving the kingdom of heaven, because as long as we harbor illusions about our own spiritual resources we will never receive from God what we absolutely need to be saved. OK, I can see that, but that sounds more difficult than I think Jesus meant it to be. This commentary teaches that to be meek means to show willingness to submit and work under proper authority. It also shows a willingness to disregard one's own "rights" and privileges. We can only be meek, willing to control our desire for our rights and privileges, because we are confident God watches out for us; that He will protect our cause. The promise "they shall inherit the earth" proves that God will not allow His meek ones to end up on the short end of the deal. I do not disagree with these interpretations, but they somehow leave me feeling ... I don't know how to express it ... a little cold in my spirit; as if they have been over-explained, if that makes any sense. I know the Beatitudes [as a whole] are meant to convey some profound meaning of my relationship with God; an overall concept that just keeps escaping me. And then during a discussion between my husband and two of my dearest Christian Sisters, Mark shared with us what he had learned from listening to a lesson by Bible teacher, Chuck Missler. And it made so much sense! Missler teaches that in order to gain the "big picture" of what Jesus is teaching us in the Beatitudes, we must consider the order in which each characteristic appears.... we are poor in spirit; we mourn; we become meek; we hunger and thirst for righteousness; we become merciful; we gain a pure heart; we are peacemakers; we are persecuted for righteousness' sake; and finally we are reviled, persecuted, and falsely accused, with the result that we will rejoice and be glad, for our reward is great in heaven. When you look at the Beatitudes as a whole, and the order in which the blessed states occur you can actually see the process of our sanctification in the Lord: We start broken (poor in spirit); have to be torn down (causing mourning) and reborn (meek and obedient). Then we seek Him (hungering and thirsting for righteousness). This process leads us to imitate Christ (being merciful, with a pure heart, and seeking peace on earth). But it will eventually lead to persecution and then redemption -- a full cycle from broken and sinful to righteousness. There is an order and purpose to the Beatitudes. That's all I need to know, and it shows me the journey that we each take to receive our Kingdom inheritance. I don't need a deep, Biblical exegesis. Because, somehow, this rather simple diagram, if you will, is more profound than all the theological presentations I've heard. It is Jesus showing me the attitudes and character I will develop as I live the Christian life through my faith in Him. It is how God wants me to live on this earth, seen through His heavenly perspective. I can't tell you how much more these well-known, and somewhat puzzling, verses mean to me, now! What joy we receive when the Word is taught by the Spirit, explaining spiritual realities with Spirit-taught words. John 7:16 Jesus answered them by saying, "My teaching is not My own, but His who sent Me". Yes! I do not write to ask, or even expect, anyone to believe what I write about just because I say it. Everyone must absolutely compare it to Scripture, pray about it, and make up their own mind about what they accept as their theology. And in the process, you will find yourself edified and knowing God on a much more personal level.